Next review Empire Today - Worst Experience of my LIFE!! We regret to hear about your dissatisfaction. Although time has passed since your post, we would like to address any unresolved concerns. You may mail your concerns and account information to customersupport@empiretoday.com. I can't believe that I have to find myself in this situation about writing a negative review. But I really have to do this because I don't want someone else experience what I experienced from empire carpet. I would have seen it coming. It started from getting a free in-home estimate. I waited for the rep to come to my house as scheduled but I didn't see anyone or even get a Courtesy call that no one was coming. When I called to find out what happened, I was told that they came but it was an empty house that no one was living in. After that huddle I later got someone came in for estimate. I was scheduled for installment and was told that I have to make at least 10% of the total pay upfront. I did as requested. The installment day, I cancelled my son's therapy appointment, had to stay up after working night shift just waiting for the installment guys. 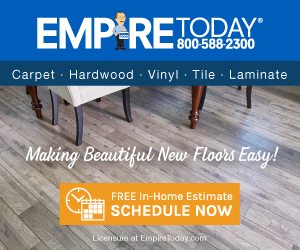 At the end, I received call that Empire doesn't have enough staff to install my carpet. I rescheduled again the same story. I rescheduled for the third time. This time I kept calling and begging them to not cancel on me. Upon till the morning of the service. I was told that they were loading the truck and will call to let me know the time they were coming. I didn't hear from them and I called back to find out what time they were coming to my house. The next thing I heard was the same old story. That they don't have enough staff go come to my house for installment. Now I ask them to cancel the service and refund my money. I was told that it's going to take 10 business days. Where in the world do you treat someone like that. You don't provide service and you don't refunds money. I demanded to talk to the supervisor and was told that there was no one available for me to talk to. This is the highest glorified scheme I have ever seen. Please this is real. Not made up. I can't believe this is happening to me. Review #866719 is a subjective opinion of User866719.